Metallica Inc has got some making up to do: 2003's St Anger probably should have stayed within the walls of the band's HQ and labelled under 'Some Kind Of Therapy'. As we step into the deepest bowels of their record company to be one of the first to hear Death Magnetic it's with fear and trepidation. Murmurings of Kirk Hammett soloing again and thrash riffage are all very well but have they been delivered on this 80-minute beast? Yes. And then some. It begins with the sound of a slow beating heart, moves into a Sanitarium-flavoured piece of clean picking. Then all hell breaks loose. This is a Metallica that many thought they would never hear again - the lighting speed rhythm guitars of Blackened and a mighty James Hetfield with new found fire in his voice. It's the sound of a band who've suddenly recognised their strengths and are somehow bridging the gap between …And Justice For all and 1991's The Black Album. What a way to start. The main riff here will be instantly recognisable to some fans - it's been salvaged from 'The Other Song' that Metallica debuted live during 2006 (and then trashed). It's much more at home in the intro here, the first of a smorgasbord of riffs in this powerhouse - including a recurring hook that is reminiscent of Pearl Jam's Animal. Kirk Hammett seems to have developed a guilty conscience for the last ten years and is soloing for his life - and yes he's brought his wah along too. "This is a Metallica that many thought they would never hear again." Another dose of heaviness with a simple but effective main riff that recalls The Black Album. It's punchy, dynamic and showcases another commanding vocal by Hetfield with a catchy refrain (something about surviving through struggle). Although even by this point we're already getting deju vu from Lars Ulrich's drum fill vocabulary. The single is well placed here after all the twists and turns of the previous three tracks. Two things are now clear: 1) The rumours of a risible mastering or mixing job on Death Magnetic are unfounded for the most part. The guitars have plenty of mid and cut through but don't sound fizzy. However, 2) Lars Ulrich's drums still sound too high in the mix on this particular song. How many mics has he got on that snare? The guitars dominate in this song. Far better than the dodgy title suggests, you might want to check your pulse if your head isn't bobbing along to the main guitar riff. Back to that Justice/Black mix territory, there's some great alternate picking that screams Dyers Eve with one of the strongest choruses of the album. Hammett's chaotic soloing fits in perfectly and there's even a false ending for good measure - hey, it worked for Def Leppard with Animal. The similarities end there. Another ominous title. It begins with Einaudi-esque mournful piano and strings before growing into a surprisingly likeable Metalliballad with some southern rock groove when it breaks. Again, Hetfield has raised his game vocally and that helps carry it while proceedings take off in the second half with some Hammett heroics. Interesting to hear the band recycling one of their old riffs here though - a burst from Ride The Lightning's title track if we're not mistaken. This one's a potential grower and tries a few riffs out for size before kicking in. The speed up, slow down dynamic on the verses are impressive and Hetfield's 'Bow Down' bellow on the chorus has more than a little Master Of Puppets to it. Metallica's first instrumental for 20 years has a lot riding on it - the pedigree and magic in the likes of Orion and To Live Is To Die cannot be overlooked. 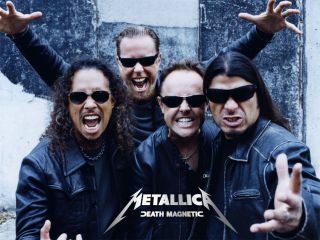 Suicide & Redemption turns into the biggest disappointment of Death Magnetic. The two core riffs simply aren't strong enough to sustain it - bereft of atmosphere, they could have been the work of any no-name metal act. For a band who've spent a large part of the album proving they've still got dynamic savvy this sounds laboured and outstays its welcome. But on the bright side - you can hear Robert Trujillo's bass rumbling along nicely. A great, thrashy way to go out and the most straight-ahead track on the album. It's almost as if producer/guru Rick Rubin has told them to 'do a Slayer' and judging by Hammett's riff around the two minute mark, the spectre of Jeff Hanneman was definitely present the in studio that day. Almost 80 minutes and a lot to take in on first listen. It's the ...And Justice For All album that is the recurring reference point here, namely on the heavier tracks. And that album's bleak and progressive thrash is a mighty yardstick. There are a couple of dips along the way and no doubt it won't be enough to sway some old school naysayers - especially critics of Lars Ulrich's avant-garde (read: limited) technique. But you have to ask yourself, what did you expect from the world's most successful metal band after all these years of underachieving in the studio? You may well be very surprised at what they've come up with this time. And if we hear more guitar riffs packed into an album this year, you can call us Dave Mustaine.